Bioglitter® – PROVEN Biodegradation in the natural environment. Biodegradability Testing and the Hierarchy of Biodegradability Testing Environments. The table below provides an illustration of the hierarchy of different levels of biodegradability testing available, relevant to different environments. We feel that is essential that we test Bioglitter® in its finished form (ie with coating) to a challenging, yet relevant natural environment, to a well-established standard and test method. Proving Bioglitter® biodegradability credentials in a challenging environment indicates more favourable results in less challenging conditions. Testing at a Fresh Water biodegradability level is a harder test than at a home composting level. Industrial composting EN13432 is the testing level most regularly referred to and most well known. However, it’s more relevant to packaging waste that can be separated and put in industrial compost recycling, not very practical for glitter. Industrial composting is conducted in man-made conditions c.60oC and high humidity. Whereas soil, wastewater, freshwater and marine testing are more representative of the biodegradability hierarchy in the natural environment. There is a significantly higher probability for glitter to be found in general waste, wastewater, fresh water and general outdoor environment after use. The route to industrial composting via the compost recycling bin is highly unlikely in reality. Standards can change, ASTM D7081-05 marine standard was withdrawn in 2014 and more recently attention has been drawn to the applicability of industrial compostability standards (EN13432, ASTM 6400) as a measure of compostability in the natural environment as the limitations of this test method become better understood. The term ‘composting’ is associated with manmade processes and ‘biodegradability’ is associated with natural environments. Considering the above and following close consultation with our accredited testing partner OWS, Belgium, it was decided freshwater biodegradability testing to ISO 14851 was most appropriate. The decision on this test method was based on the nature of our material (insoluble solid as opposed to a chemical) and the most probable end of life scenarios for Bioglitter®. This biodegradation test determines the degree of aerobic biodegradability of the test samples by exposure to micro-organisms in a water-based medium (under laboratory conditions) representative of the natural environment, such as rivers, streams or lakes. During the aerobic biodegradation of biodegradable materials, oxygen is consumed and carbon is converted to carbon dioxide (CO2). The amount of biodegradation can be calculated from how much carbon converted to CO2. 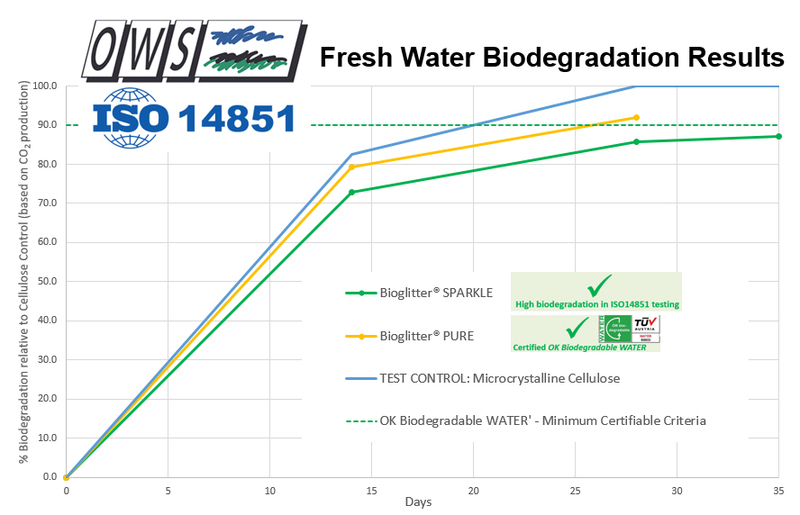 The test results as illustrated in the chart above demonstrate the vast majority of both Bioglitter® SPARKLE and Bioglitter® PURE biodegrades in a freshwater environment in only 4 weeks. It also proves that the coating applied in the manufacture of Bioglitter® does not compromise the performance characteristics of the Modified Regenerated Cellulose core to biodegrade. 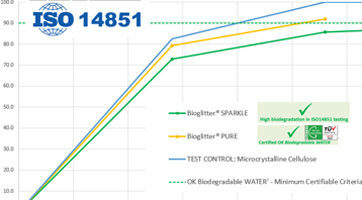 Bioglitter® Sparkle Silver 008 (with clear coating) has biodegraded to a level of 87% (relative to the microcrystalline cellulose control) in considerably less time than the 56 day test limit. Which proves that the vast majority of the biodegradable content in Bioglitter Sparkle does biodegrade in the natural environment and is only 3% off meeting the performance criteria for certification. A level of >90% biodegradation within 56 days relative to the microcrystalline cellulose control is required to meet the criteria for OK biodegradable WATER certification. Our aim of reducing/removing the plastic content in the coatings used in our Bioglitter® Sparkle will ultimately allow us to achieve this target. Bioglitter® Pure Red 008 achieved 92% biodegradation, relative to cellulose control, and therefore meets the criteria for OK biodegradable WATER certification, after only 28 days. A level of >90% biodegradation within 56 days relative to the microcrystalline cellulose control is required to meet the criteria for OK biodegradable WATER certification.